Carbonatite ( /kɑːrˈbɒnətaɪt/) is a type of intrusive or extrusive igneous rock defined by mineralogic composition consisting of greater than 50% carbonate minerals. Carbonatites may be confused with marble and may require geochemical verification. Carbonatites usually occur as small plugs within zoned alkalic intrusive complexes, or as dikes, sills, breccias, and veins. They are almost exclusively associated with continental rift-related tectonic settings. It seems that there has been a steady increase in the carbonatitic igneous activity through the Earth's history, from the Archean eon to the present. Nearly all carbonatite occurrences are intrusives or subvolcanic intrusives. 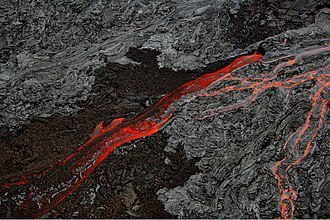 This is because carbonatite lava flows, being composed largely of soluble carbonates, are easily weathered and are therefore unlikely to be preserved in the geologic record. 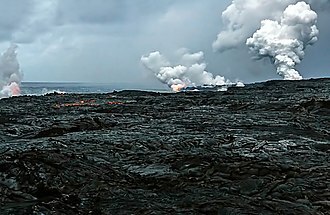 Carbonatite eruptions as lava may therefore not be as uncommon as thought, but they have been poorly preserved throughout the Earth's history. 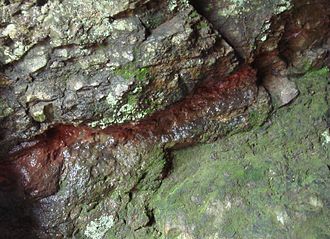 Carbonatite liquid compositions are significantly more alkaline than what is preserved in the fossil carbonatite rock record as composition of the melt inclusions shows. Only one carbonatite volcano is known to have erupted in historical time, the active Ol Doinyo Lengai volcano in Tanzania. It erupts with the lowest-temperature lava in the world, at 500–600 °C. The lava is natrocarbonatite dominated by nyerereite and gregoryite. The magmatic origin of carbonatite was argued in detail by Swedish geologist Harry von Eckermann in 1948 basen on his study of Alnö Complex. 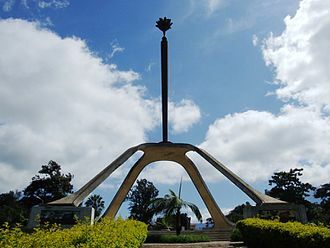 It was however the 1960 eruption of Ol Doinyo Lengai in Tanzania that led to geological investigations that finally confirmed the view that carbonatite is derived from magma. Evidence for each process exists, but the key is that these are unusual phenomena. Historically, carbonatites were thought to form by melting of limestone or marble by intrusion of magma, but geochemical and mineralogical data discount this. For example, the carbon isotopic composition of carbonatites is mantle-like and not like sedimentary limestone. Primary mineralogy is highly variable, but may include natrolite, sodalite, apatite, magnetite, barite, fluorite, ancylite group minerals, and other rare minerals not found in more common igneous rocks. Recognition of carbonatites may be difficult, especially as their mineralogy and texture may not differ much from marble except the presence of igneous minerals. They may also be sources of mica or vermiculite. Carbonatites are classed as calcitic sovite (coarse textured) and alvikite (finer textured) varieties or facies. The two are also distinguished by minor and trace element composition. The terms rauhaugite and beforsite refer to dolomite- and ankerite-rich occurrences respectively. The alkali-carbonatites are termed lengaite. Examples with 50–70% carbonate minerals are termed silico-carbonatites. Additionally, carbonatites may be either enriched in magnetite and apatite or rare-earth elements, fluorine and barium. Natrocarbonatite is made up largely of two minerals, nyerereite (named after Julius Nyerere, the first president of independent Tanzania) and gregoryite (named after John Walter Gregory, one of the first geologists to study the East African Rift and author of the book The Great Rift Valley). These minerals are both carbonates in which sodium and potassium are present in significant quantities. Both are anhydrous, and when they come into contact with the moisture in the atmosphere, they begin to react extremely quickly. 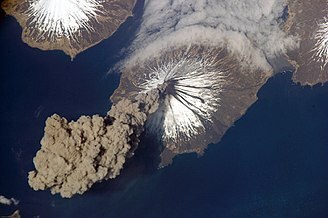 The black or dark brown lava and ash erupted begins to turn white within a few hours. Magnesiocarbonatite, from Verity-Paradise Carbonatite Complex of British Columbia. Specimen is 75 mm wide. Carbonatite is composed predominantly of carbonate minerals and extremely unusual in its major element composition as compared to silicate igneous rocks, obviously because it is composed primarily of Na2O and CaO plus CO2. 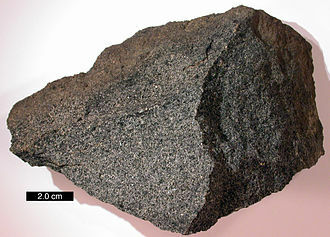 Most carbonatites tend to include some silicate mineral fraction; by definition an igneous rock containing >50% carbonate minerals is classified as a carbonatite. Silicate minerals associated with such compositions are pyroxene, olivine, and silica-undersaturated minerals such as nepheline and other feldspathoids. Geochemically, carbonatites are dominated by incompatible elements (Ba, Cs, Rb) and depletions in compatible elements (Hf, Zr, Ti). This together with their silica-undersaturated composition supports inferences that carbonatites are formed by low degrees of partial melting. A specific type of hydrothermal alteration termed fenitization is typically associated with carbonatite intrusions. This alteration assemblage produces a unique rock mineralogy termed a fenite after its type locality, the Fen Complex in Norway. The alteration consists of metasomatic halos consisting of sodium rich silicates arfvedsonite, barkevikite and glaucophane along with phosphates, hematite and other iron and titanium oxides. 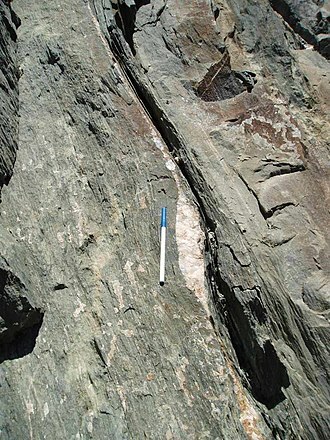 Associated igneous rocks typically include ijolite, melteigite, teschenite, lamprophyres, phonolite, foyaite, shonkinite, silica undersaturated foid-bearing pyroxenite (essexite), and nepheline syenite. Carbonatites are typically associated with undersaturated (low silica) igneous rocks that are either alkali (Na2O and K2O), ferric iron (Fe2O3) and zirconium-rich agpaitic rocks or alkali-poor, FeO-CaO-MgO-rich and zirconium-poor miaskitic rocks. 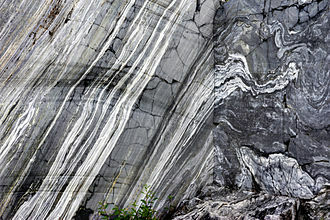 The Mount Weld carbonatite is unassociated with a belt or suite of alkaline igneous rocks, although calc-alkaline magmas are known in the region. The genesis of this Archaean carbonatite remains contentious as it is the sole example of an Archaean carbonatite in Australia. 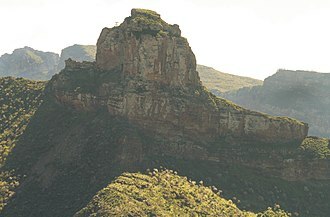 Carbonatite is known to form in association with concentrically zoned complexes of alkaline-igneous rocks, the typical example of this being Phalaborwa, South Africa. Carbonatites take the form of sills, lopoliths and rare dikes are reported in the Guyana Shield. The Mud Tank and Mount Weld carbonatites take the form of multi-stage cylindrical intrusive bodies with several distinct phases of carbonatite intrusion. Smaller carbonatite sills and dikes are present in other Proterozoic mobile belts in Australia, typically as dikes and discontinuous pods. the Avon Volcanic District, Missouri. In 2017, the discovery of a new carbonatite deposit was confirmed north-west of Prince George, British Columbia, in a region termed the "Rocky Mountain Rare Metal Belt". The volcano Ol Doinyo Lengai, in the East African Rift is the world's only active carbonatite volcano. Other older carbonatite volcanoes are located in the same region, including Mount Homa. 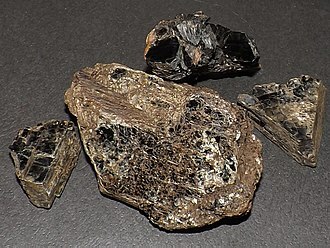 Carbonatites may contain economic or anomalous concentrations of rare-earth elements, phosphorus, niobium–tantalum, uranium, thorium, copper, iron, titanium, vanadium, barium, fluorine, zirconium, and other rare or incompatible elements. Apatite, barite and vermiculite are among the industrially important minerals associated with some carbonatites. Vein deposits of thorium, fluorite, or rare-earth elements may be associated with carbonatites and may be hosted internal to or within the metasomatized aureole of a carbonatite. 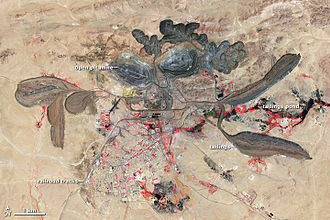 As an example, the Palabora complex of South Africa has produced significant copper (as chalcopyrite, bornite and chalcocite), apatite, vermiculte along with lesser magnetite, linnaeite (cobalt), baddeleyite (zirconium–hafnium), and by-product gold, silver, nickel and platinum. ^ Bell, Keith (editor) (1989) Carbonatites: Genesis and Evolution, London, Unwin Hyman. ^ Stoppa, Francesco; Jones, Adrian P.; Sharygin, Victor V. (2009). "Nyerereite from carbonatite rocks at Vulture volcano: implications for mantle metasomatism and petrogenesis of alkali carbonate melts". Central European Journal of Geosciences. 1: 131–151. doi:10.2478/v10085-009-0012-9. 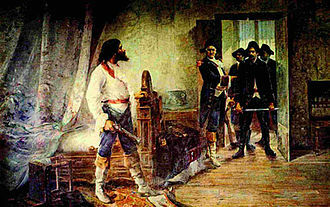 ^ Guzmics, Tibor; Mitchell, Roger H.; Szabó, Csaba; Berkesi, Márta; Milke, Ralf; Ratter, Kitti (2012). "Liquid immiscibility between silicate, carbonate and sulfide melts in melt inclusions hosted in co-precipitated minerals from Kerimasi volcano (Tanzania): evolution of carbonated nephelinitic magma". Contributions to Mineralogy and Petrology. 164: 101–122. doi:10.1007/s00410-012-0728-6. ^ a b Hode Vuorinen, Jaana (2005). The Alnö alkaline and carbonatitic complex, east central Sweden – a petrogenetic study (Ph.D.). Stockholm University. pp. 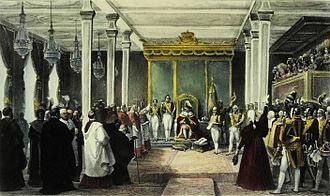 1–28. ^ Shavers, Ethan J.; Ghulam, Abduwasit; Encarnacion, John; Bridges, David L.; Luetkemeyer, P. Benjamin (2016-04-01). "Carbonatite associated with ultramafic diatremes in the Avon Volcanic District, Missouri, USA: Field, petrographic, and geochemical constraints". Lithos. 248–251: 506–516. doi:10.1016/j.lithos.2016.02.005. 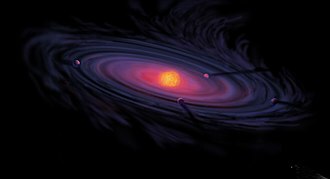 ^ http://sajg.geoscienceworld.org/cgi/content/abstract/102/2/109 M. J. Le Bas, Sovite and alvikite; two chemically distinct calciocarbonatites C1 and C2, South African Journal of Geology; June 1999; v. 102; no. 2; p. 109–121. ^ a b Peter Kresten, Carbonatite nomenclature, International Journal of Earth Sciences, Volume 72, Number 1 / February, 1983. ^ Shavers, Ethan J. "Carbonatite associated with ultramafic diatremes in the Avon Volcanic District, Missouri, USA: Field, petrographic, and geochemical constraints". Lithos. 248-251: 506–516. doi:10.1016/j.lithos.2016.02.005. ^ "German Geologist Discovers a Rare Carbonatite Complex in British Columbia" (PDF). Duncan R. K., Willett G. C. (1990) – Mount Weld Carbonatite: in Hughes F. E. (Ed. ), 1990 Geology of the Mineral Deposits of Australia & Papua New Guinea The AusIMM, Melbourne Mono 14, v. 1 pp. 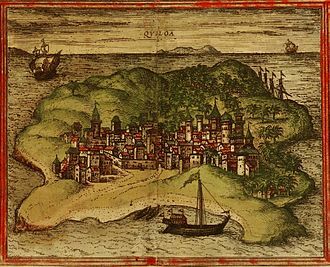 591–597. "Carbonatite Deposits" (PDF). USGS Carbonatite Deposits. Retrieved January 31, 2005. "Descriptive Model of Carbonatite Deposits". USGS Descriptive Model of Carbonatite Deposits. Retrieved January 31, 2005. "World's Coolest Lava is in Africa". Volcano Watch April 17, 2003. Retrieved January 31, 2005. "Rare earth minerals in carbonatites of Basal Complex of Fuerteventura (Canary Islands, Spain)" (PDF). 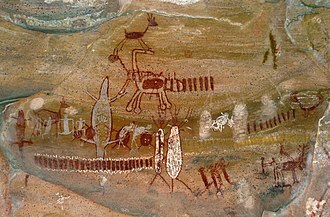 Wikimedia Commons has media related to Carbonatite. Natrolite is a tectosilicate mineral species belonging to the zeolite group. It is a hydrated sodium and aluminium silicate with the formula Na2Al2Si3O10 · 2H2O, the type locality is Hohentwiel, Germany. It was named natrolite by Martin Heinrich Klaproth in 1803, the name is derived from νατρών natron, the Greek word for soda, in reference to the sodium content and λίθος lithos, meaning stone. Needle stone or needle-zeolite are other names, alluding to the common acicular habit of the crystals. The crystals are frequently epitaxial overgrowths of natrolite, larger crystals most commonly have the form of a square prism terminated by a low pyramid, the prism angle being nearly a right angle. The crystals are tetragonal in appearance, though actually orthorhombic, there are perfect cleavages parallel to the faces of the prism. The mineral occurs in compact fibrous aggregates, the fibers having a divergent or radial arrangement. Natrolite is readily distinguished from other fibrous zeolites by its optical characteristics, between crossed nicols the fibers extinguish parallel to their length, and they do not show an optic figure in convergent polarized light. Natrolite is usually white or colorless, but sometimes reddish or yellowish, the luster is vitreous, or, in finely fibrous specimens, silky. The specific gravity is 2.2, and the hardness is 5.5, the mineral is readily fusible, melting in a candle-flame to which it imparts a yellow color owing to the presence of sodium. It is decomposed by hydrochloric acid with separation of gelatinous silica, natrolite occurs with other zeolites in the amygdaloidal cavities of basaltic igneous rocks. It is common in nepheline syenites, excellent specimens of diverging groups of white prismatic crystals are found in compact basalt at the Puy-deMarman, Puy-de-Dôme, France. Huge crystals have found on the Kola Peninsula, Russia. Mont St. Hilaire, Quebec has produced large crystals associated with many rare minerals, the Bay of Fundy in Nova Scotia, New Jersey and British Columbia have produced excellent specimens. Several varieties of natrolite have been distinguished by special names, fargite is a red natrolite from Glenfarg in Perthshire. 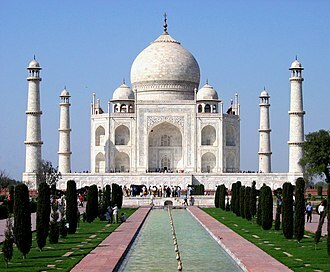 The history of Earth concerns the development of the planet Earth from its formation to the present day. 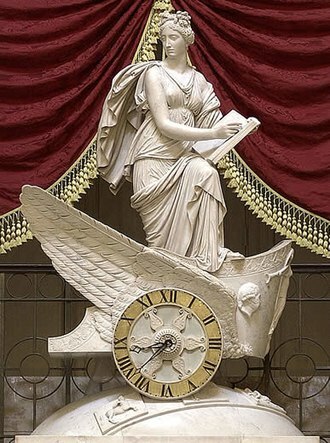 Nearly all branches of science have contributed to the understanding of the main events of the Earths past. The age of Earth is approximately one-third of the age of the universe, an immense amount of geological change has occurred in that timespan, accompanied by the emergence of life and its subsequent evolution. Earth formed around 4.54 billion years ago by accretion from the solar nebula, volcanic outgassing probably created the primordial atmosphere and the ocean, but the atmosphere contained almost no oxygen and so would have been toxic to most modern life including humans. Much of the Earth was molten because of frequent collisions with other bodies which led to extreme volcanism. 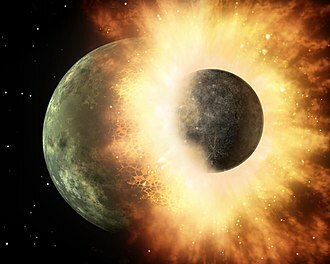 A giant impact collision with a body named Theia while Earth was in its earliest stage. Over time, the Earth cooled, causing the formation of a solid crust, the geological time scale clock depicts the larger spans of time from the beginning of the Earth as well as a chronology of some definitive events of Earth history. The Archean and Proterozoic eons follow, they produced the abiogenesis of life on Earth, there are microbial mat fossils such as stromatolites found in 3.48 billion-year-old sandstone discovered in Western Australia. According to one of the researchers, If life arose relatively quickly on Earth … it could be common in the universe, living forms derived from photosynthesis appeared between 3.2 and 2.4 billion years ago and began enriching the atmosphere with oxygen. More than 99 percent of all species, amounting to five billion species. Estimates on the number of Earths current species range from 10 million to 14 million, of which about 1.2 million have been documented and over 86 percent have not yet been described. More recently, in May 2016, scientists reported that 1 trillion species are estimated to be on Earth currently with only one-thousandth of one percent described. Geological change has been a constant of Earths crust since the time of its formation, species continue to evolve, taking on new forms, splitting into daughter species or going extinct in the process of adapting or dying in response to ever-changing physical environments. A mineral is a naturally occurring chemical compound, usually of crystalline form and abiogenic in origin. A mineral has one specific chemical composition, whereas a rock can be an aggregate of different minerals or mineraloids, the study of minerals is called mineralogy. There are over 5,300 known mineral species, over 5,070 of these have been approved by the International Mineralogical Association, the silicate minerals compose over 90% of the Earths crust. The diversity and abundance of species is controlled by the Earths chemistry. Silicon and oxygen constitute approximately 75% of the Earths crust, which translates directly into the predominance of silicate minerals, minerals are distinguished by various chemical and physical properties. Differences in chemical composition and crystal structure distinguish the various species, changes in the temperature, pressure, or bulk composition of a rock mass cause changes in its minerals. Minerals can be described by their various properties, which are related to their chemical structure. Common distinguishing characteristics include crystal structure and habit, lustre, colour, tenacity, fracture, more specific tests for describing minerals include magnetism, taste or smell and reaction to acid. Minerals are classified by key chemical constituents, the two dominant systems are the Dana classification and the Strunz classification, the silicate class of minerals is subdivided into six subclasses by the degree of polymerization in the chemical structure. All silicate minerals have a unit of a 4− silica tetrahedron—that is, a silicon cation coordinated by four oxygen anions. 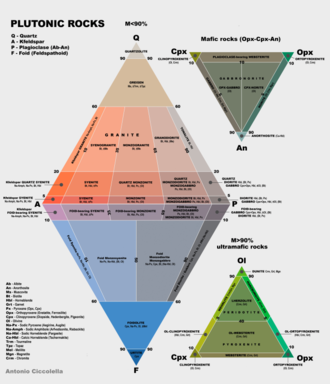 These tetrahedra can be polymerized to give the subclasses, disilicates, inosilicates, other important mineral groups include the native elements, oxides, carbonates and phosphates. The first criterion means that a mineral has to form by a natural process, stability at room temperature, in the simplest sense, is synonymous to the mineral being solid. More specifically, a compound has to be stable or metastable at 25 °C, modern advances have included extensive study of liquid crystals, which extensively involve mineralogy. Baryte or barite is a mineral consisting of barium sulfate. The baryte group consists of baryte, celestine and anhydrite, baryte is generally white or colorless, and is the main source of barium. Baryte and celestine form a solid solution SO4, the radiating form, sometimes referred to as Bologna Stone, attained some notoriety among alchemists for the phosphorescent specimens found in the 17th century near Bologna by Vincenzo Casciarolo. In practice, this is usually the mineral baryte, most crude baryte requires some upgrading to minimum purity or density. Baryte that is used as an aggregate in a heavy cement is crushed and screened to a uniform size, the name baryte is derived from the Greek word βαρύς. Other names have been used for baryte, including barytine, schwerspath, Heavy Spar, baryte occurs in a large number of depositional environments, and is deposited through a large number of processes including biogenic and evaporation, among others. Baryte commonly occurs in veins in limestones, in hot spring deposits. It is often associated with the minerals anglesite and celestine and it has been identified in meteorites. It is mined in Arkansas, Virginia, North Carolina, Tennessee, Nevada, world baryte production for 2014 was 9.7 million tonnes. The major baryte producers are as follows, India, United States, Iran and Kazakhstan. The main users of baryte in 2014 were US, Gulf States, 77% of baryte worldwide is used as a weighting agent for drilling fluids in oil and gas exploration to suppress high formation pressures and prevent blowouts. As a well is drilled, the bit passes through various formations, the deeper the hole, the more baryte is needed as a percentage of the total mud mix. 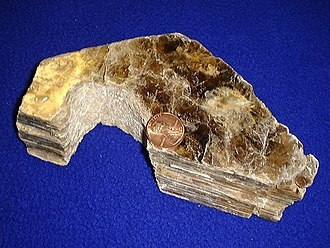 Baryte used for drilling petroleum wells can be black, brown or gray depending on the ore body. The baryte is finely ground so that at least 97% of the material, by weight, can pass through a 200-mesh screen, in August 2010 API published specifications to modify the 4.2 drilling grade standards for baryte to include 4.1 SG materials. Dolomite is an anhydrous carbonate mineral composed of calcium magnesium carbonate, ideally CaMg2. The term is used for a sedimentary carbonate rock composed mostly of the mineral dolomite. An alternative name used for the dolomitic rock type is dolostone. Most probably the mineral dolomite was first described by Carl Linnaeus in 1768, nicolas-Théodore de Saussure first named the mineral in March 1792. The mineral dolomite crystallizes in the trigonal-rhombohedral system and it forms white, gray, or pink crystals. Dolomite is a carbonate, having an alternating structural arrangement of calcium and magnesium ions. It does not rapidly dissolve or effervesce in dilute hydrochloric acid as calcite does, solid solution exists between dolomite, the iron-dominant ankerite and the manganese-dominant kutnohorite. Small amounts of iron in the give the crystals a yellow to brown tint. Manganese substitutes in the structure up to three percent MnO. A high manganese content gives the crystals a rosy pink color, lead and cobalt substitute in the structure for magnesium. The mineral dolomite is closely related to huntite Mg3Ca4, because dolomite can be dissolved by slightly acidic water, areas of dolomite are important as aquifers and contribute to karst terrain formation. Modern dolomite formation has been found to occur under conditions in supersaturated saline lagoons along the Rio de Janeiro coast of Brazil, Lagoa Vermelha. It is often thought that dolomite will develop only with the help of sulfate-reducing bacteria, low-temperature dolomite may occur in natural environments rich in organic matter and microbial cell surfaces. This occurs as a result of magnesium complexation by carboxyl groups associated with organic matter, vast deposits of dolomite are present in the geological record, but the mineral is relatively rare in modern environments. Reproducible, inorganic low-temperature syntheses of dolomite and magnesite were published for the first time in 1999, the general principle governing the course of this irreversible geochemical reaction has been coined breaking Ostwalds step rule. Igneous rock, or magmatic rock, is one of the three main rock types, the others being sedimentary and metamorphic. Igneous rock is formed through the cooling and solidification of magma or lava, the magma can be derived from partial melts of existing rocks in either a planets mantle or crust. Typically, the melting is caused by one or more of three processes, an increase in temperature, a decrease in pressure, or a change in composition, solidification into rock occurs either below the surface as intrusive rocks or on the surface as extrusive rocks. Igneous rock may form with crystallization to form granular, crystalline rocks and metamorphic rocks make up 90–95% of the top 16 km of the Earths crust by volume. Igneous rocks form about 15% of the Earths current land surface, most of the Earths oceanic crust is made of igneous rock. 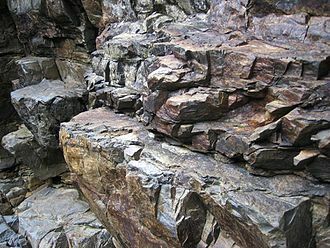 In terms of modes of occurrence, igneous rocks can be either intrusive or extrusive, the mineral grains in such rocks can generally be identified with the naked eye. Intrusive rocks can be classified according to the shape and size of the intrusive body, typical intrusive formations are batholiths, laccoliths and dikes. When the magma solidifies within the earths crust, it cools slowly forming coarse textured rocks, such as granite, the central cores of major mountain ranges consist of intrusive igneous rocks, usually granite. When exposed by erosion, these cores may occupy huge areas of the Earths surface, intrusive igneous rocks that form at depth within the crust are termed plutonic rocks and are usually coarse-grained. 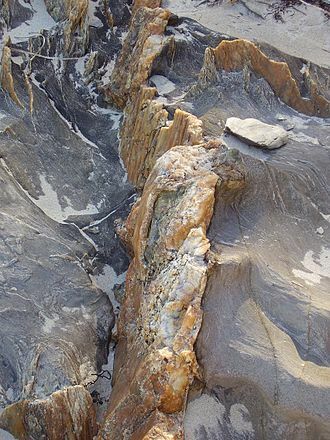 Intrusive igneous rocks that form near the surface are termed subvolcanic or hypabyssal rocks, hypabyssal rocks are less common than plutonic or volcanic rocks and often form dikes, laccoliths, lopoliths, or phacoliths. Extrusive igneous rocks, known as rocks, are formed at the crusts surface as a result of the partial melting of rocks within the mantle. Extrusive igneous rocks cool and solidify quicker than intrusive igneous rocks and they are formed by the cooling of molten magma on the earths surface. 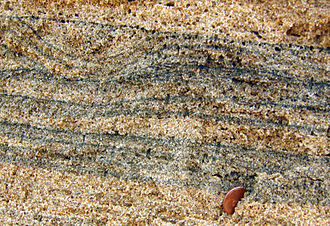 Magnetite and other heavy minerals (dark) in a quartz beach sand (Chennai, India). An aerial view of the Gros Piton and Petit Piton, in St. Lucia, 2006. Volcanic plug near Rhumsiki, Cameroon. Saint Michel d'Aiguilhe chapel, on top of a volcanic plug in Le Puy-en-Velay, France. Fluorescing fluorite from Boltsburn Mine, Weardale, North Pennines, County Durham, England, UK. Crawford Cup (Roman, 50-100 CE) in the collection of the British Museum. Made of fluorite. Solidified lava in the crater of Ol Doinyo Lengai. Crater of the Ol Doinyo Lengai with recent (hours-old at time of photograph) lava flow.